We’ve been selling books at comic cons, art festivals, and outdoor markets since 2010. It’s time to embrace a new kind of bookstore, so we’re building one. Crimson Melodies Pub. is a small press that features speculative fiction with a dark or thrilling twist. Most of our heroes are flawed, and all of them will capture your attention. 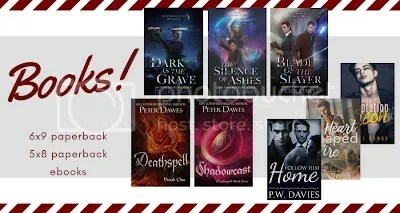 We’ve been publishing more than a book a year since 2009, ranging from dark urban fantasy to romantic suspense to historical fantasy with magical elements. Kickstarter is a crowdfunding platform tailored for all sorts of creative projects. Creators offer rewards as a way to form a community and gather support for the project that they’re working on. 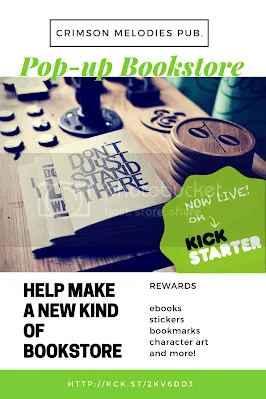 Our Kickstarter is about creating a pop-up bookstore. We’re offering rewards as simple as a digital download of a short-story collection from our authors, to custom created artwork of the main characters in two of our published series. There’s also bookmarks, stickers, and our entire catalog of books up for grabs. 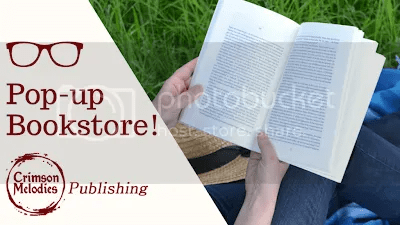 Crimson Melodies Publishing – an independent small press for speculative fiction. We sell our books both digitally and in print, and one of the ways we reach readers is by exhibiting at conventions like comic con.